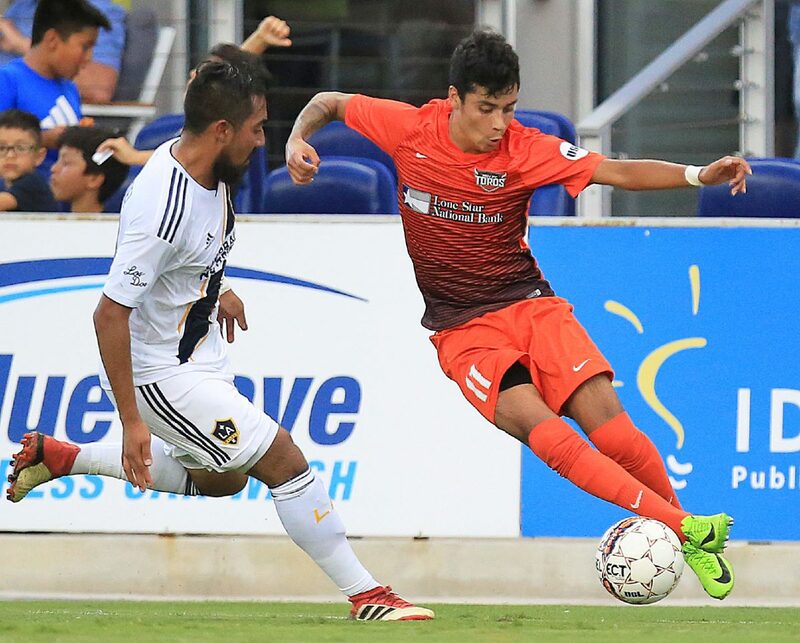 EDINBURG — The RGV FC Toros, who sit in 16th place in the 17-team Western Conference, host the second-place Phoenix Rising at 7:30 tonight at H-E-B Park. The game is an undeniable mismatch on paper that can be summed up by the 21 points separating the two clubs in the standings. Still, the Toros feel they have the ingredients for an upset. The main reason for optimism is the Toros’ performances at home. Their last outing at H-E-BPark was their first loss in eight matches at home this year. Most of the results were ties, but the chances always existed. 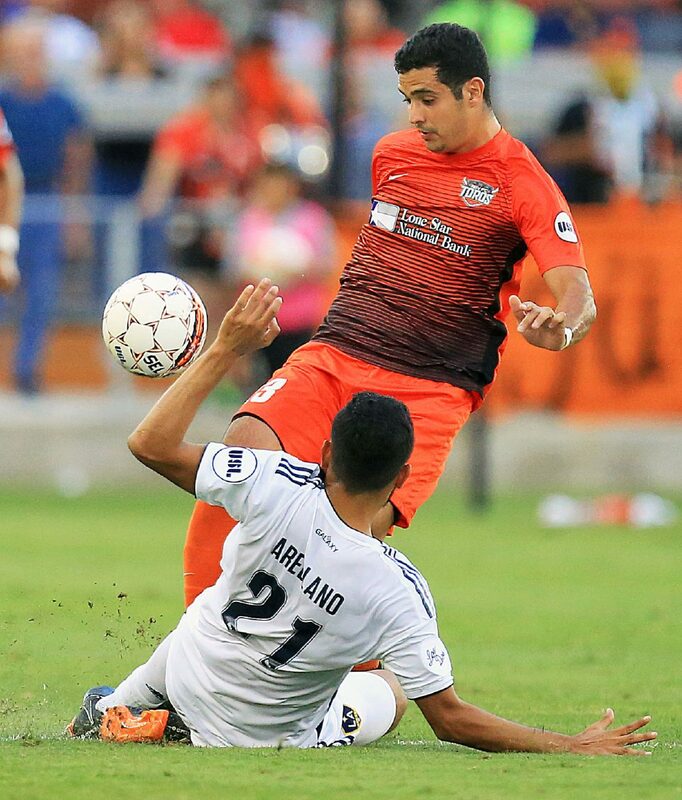 Rio Grande Valley FC Toros' forward Aldo Quintanilla (23) and LA Galaxy II's defender Hugo Arellano (21) battle for the ball during a United Soccer League season game at H-E-B Park on Wednesday, May 23, 2018 in Rio Grande City. Rio Grande Valley FC Toros's forward Jesús Enríquez (11) and LA Galaxy II's midfielder Jonathan Hernandez (67) battle for the ball during a United Soccer League season game at H-E-B Park on Wednesday, May 23, 2018 in Rio Grande City. Toros coach Gerson Echeverry also said the issues are in the details of a match, and show up in specific moments that become turning points in those matches. After a weekday practice that had to be modified and moved indoors due to the severe weather conditions in the Valley, Echeverry acknowledged that the time to be patient and wait for success to come is over. The coach admitted that “getting close” isn’t acceptable this late in the season. Consistent lack of offense is the Achilles’ heel for the Toros. They’ve only scored 14 goals in 14 contests, a total that ties them with San Antonio FC for fourth worst in the Western Conference. The first-year coach was insightful when he assessed the frustration the young, orange-clad group is facing in 2018. “We train every day and they’re constantly passing quizzes, and the game on Saturday when we play under the lights is the test, and you either pass or you don’t,” Echeverry said. Despite the low conversion rate on the campaign, he feels constant scolding of the team could wear on his players’ psychologically and isn’t the best path. For a team that has failed to get points in their last three games due to consecutive losses, the mistakes seem to be the telling theme of their streak. Defender Kyle Adams acknowledged that his group plays well for most of their matches, but the consequences of slipping for even one play are costly. While the season has been disappointing for them, a three-point result could help them leap over a club and tie two others, if those teams don’t also earn points this week. Wharton, the Toros’ team captain, spoke after practice, knowing that his team has the tools to take down a tough team in their backyard. “At home I think we’ve been the better team for probably every single game,” Wharton said.